You may have heard about the excess of gamma-ray emission from the center of the Milky Way measured by the Fermi telescope. This excess can be interpreted as a signal of a 30-40 GeV dark matter particle - the so-called hooperon - annihilating into a pair of b-quarks. The inferred annihilation cross section is of order 1 picobarn, perfectly fitting the thermal dark matter paradigm. The story is not exactly new; the anomaly and its dark matter interpretation was first claimed 4 years ago. Since then there has been a steady trickle of papers by different groups arguing that the signal is robust and proposing dark matter or astrophysical explanations. Last week the story hit several news outlets, see for example here for a nice write up. What has changed that the anomaly was upgraded from a tantalizing hint to a compelling evidence of WIMP dark matter? Now, WIMP dark matter can easily reproduce the new component. Cold dark matter is expected to be sharply peaked near the galactic center, with the 1/r or similar profile. Furthermore, when dark matter annihilates into charged particles, the latter can radiate a part of their energy producing photons via the final state radiation, Compton scattering, and bremsstrahlung. This leads to emission of gamma rays with the energy spectrum depending on the dark matter mass and the identity of particles it annihilates into. Annihilation into leptons (electron, muons, taus) would produce a sharper peak than what is observed. As the plot shows, annihilation into quarks, whether the bottom or lighter one, fits the signal much better. 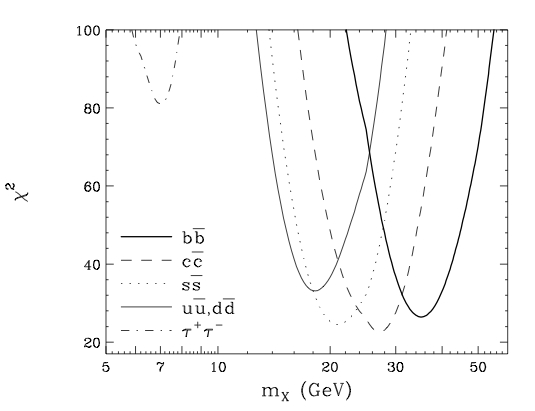 All in all, the excess can be explained by a 15-40 GeV dark matter particle annihilating into quarks with the cross section in the 0.1-1 pb range. This was known before, more or less. As far as I understand, the recent paper by Daylan et al. adds the following. They repeat the analysis using a subset of the Fermi data where the photon direction is more reliably reconstructed. This allows them to better study the morphology of the signal. They show that the excess is steeply falling (approximately as 1/r^1.4) all the way to about 2 kiloparsecs from the galactic center. Moreover, they demonstrate that the excess is to a good degree spherically symmetric. This can be regarded as an argument against conventional astrophysical explanations. For example, a school of several thousand milisecond pulsars could produce a similar energy spectrum as the excess, but would not be expected to be distributed this way. In any case, continuous emission from the galactic center will never be regarded as a convincing evidence of dark matter. To really get excited we would need to find a matching signal in a less messy environment. One possibility is the dwarf galaxies - small galaxies consisting mostly of dark matter that orbit the Milky Way. The Fermi collaboration recently reported the limits on the dark matter annihilation cross section based on observations of 25 dwarf galaxies, see the plot. Intriguingly, there is a small excess (global p-value 0.08) that may be consistent with the dark matter interpretation of the signal from the galactic centre... More data should clarify the situation, but for that we probably need to wait a few more years. Haven't we been down this same road several times before? What are the characteristics of the Gamma-ray excess that are unique to the particle dark matter interpretation and could not be explained by several other models that do not invoke hypothetical particles, but rather only require known constituents of the Galaxy and dwarf galaxies? What's the difference between "astrophysical sigmas" and those used in conventional statistics? Probably a stupid question : if the mass is between 15 and 40 GeV, could an accelerator such as the LHC see these particles ? Typically, when the sigmas on a questionable signal get stupid-big, it's because you can't (or choose not to) calculate systematic error correctly, not because you can't calculate the actual sigmas. It's my understanding that the ATLAS and CMS monojet searches already exclude the vanilla models. The authors point to some models that are not excluded yet, but at 14 TeV most, if not all, of this parameter space should be covered. As someone who was there, you have (understandably given you have just the slides to work with) misquoted the talk by Murgia a bit. She seemed to be saying that there is something to discuss, but the collaboration is not currently prepared to be quantitative at this point. She also mentioned an analysis coming out soon which should be more definitive. Does the top quark exist at 40 sigma? Seems like some people need to brush up on their statistics. 1) I know that 1 picobarn is the WIMP-WIMP cross section, not the WIMP-nucleon cross section. However, do plausible models for WIMP behavior give any rough relationship between WIMP-WIMP cross-sections and other cross-sections? Could we take that WIMP-WIMP cross-section and get a rough estimate of what sorts of events this particle might produce at the LHC? 2) Suppose that 7 keV sterile neutrinos (the subject of a recent post) exist. They are also dark matter candidates. Would they have the same approximate spatial distribution as 30-40 GeV WIMPs? I ask because one of the key things in this WIMP claim is that they are distributed in the way you'd expect of dark matter. Can the same be said of the alleged 7keV sterile neutrinos? To follow on Alex' comment, a more fundamental question would be: What would Nature choose such a large scale separation between the two alleged manifestations of Dark Matter (7 keV sterile neutrinos and the 30-40 GeV WIMPs)? Is it possible to understand why it would couple only to b-quarks out of 6 quarks? Alex, in any specific model the relationship exists, however it's very model dependent. For example, it depends on which quarks the dark matter particle couples to, whether or not the couplings are spin dependent, etc. Some plausible models, such as dark matter coupled to us via the Higgs boson, are already excluded in this parameter range. About 7 keV neutrinos: in the first approximation they would be distributed in a similar way. 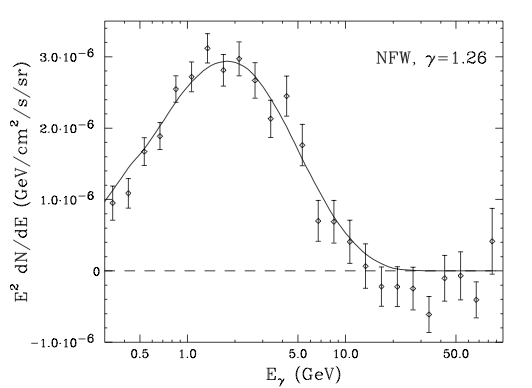 At a more quantitative level there could be differences due to "warmness" of keV dark matter. Kashyap, yes it's quite easy to write down a model where e.g. dark matter is coupled only to the 3rd generation quarks. But we don't know that from the data. A coupling to lighter quarks or to all quarks democratically gives a similarly good fit. Jester: "astrophysical sigma smaller and rounded at the edges" - LOL. Anonymous: "Does the top quark exist at 40 sigma?" Don't be silly (the same comment applies to your unfounded accusation that the authors don't understand chi-squared). Of course that it does. The LHC is producing a top quark pair every few seconds or so. It has surely produced millions of them. One top quark or so is enough to substantially reduce the probability that it's noise, imagine it's a 1-sigma bump. Millions of top quarks surely give you thousands of sigmas of certainty that it is not noise. Whether the huge bump is "exactly" the Standard Model top quark of course cannot be proven - after all, it is almost certainly *not* an exact Standard Model behind all of this. But the null hypothesis that there is *no* quark around this mass has surely been eliminated at thousands of sigmas. Every known particle or "safe fact" about repeatable experiments from the textbooks is known at thousands of sigmas! The "marginal cases" of debating 2-3 sigmas are only about some truly uncertain cutting edge but for a true fact, it is extremely unlikely that the evidence in favor of it will fall between 2 and 4 sigmas. Much more likely, it will be either completely invisible (de facto 0-1 sigma) or almost completely certain (hundreds or thousands or millions of sigmas). Just continuing to see the same thing adds the sigmas as the sqrt(N). In models which predict sterile neutrino DM in this mass range, for instance those from Shaposhnikov et al., there are also (degenerate) heavier sterile neutrinos in the GeV mass range. Does anyone know if these could affect the anomalous magnetic moment of the muon sufficiently to explain the discrepancy observed in the BNL E821 muon g-2 experiment? I think sterile neutrinos alone give a negligible contribution to the muon anomalous magnetic moment. There are papers relating the two but as far as I understand they rely on additional particles (charged Higgs bosons for example). So there is no direct connection. It seems that in her preliminary analysis Murgia considered the source corresponding to SgrA*, 2FGL J1745.6-2858, as a point source, subtracted it, and found no residuals, while Dahlan et al., due to their selection of "high quality events", found an extended distribution around SgrA*, which they interpret as due to a dark matter distribution having a cusp. Interesting! It thus all depends on how you treat the events, and how to attribute the diffuse and point source emission due to non-dark matter causes. Not everybody thinks that the dark matter distribution in spiral galaxies such as the Milky Way is cuspy, anyway. I don't even know if I exist to a 40-sigma confidence. I think I exist to 40-sigma significance, therefore I am. Skimming through the Fermi paper, with the number of investigations they did, it's not surprising that one test returns a p-value of 0.08. Since all the other results are deemed insignificant, I have trouble getting excited by this one outlier. There clearly is a gamma ray excess and some unexpected structure towards the center of the Milky Way. But with a quoted significance this extreme, I think it's perfectly reasonable to be skeptical. Whether this result is due to overfitting, poor accounting of model degrees of freedom, or p-value hunting I don't know. When it looks too good to be true, it often is. Violence is boring?! Surely you jest! The dismissive nature of many of the comments here on how particle astrophysicists do statistics by those unwilling to reveal their identity is more than a bit offensive. Setting that aside, I think the recent work by our group at UC Irvine from 2012 and recently, as well as Gordon & Macias and Daylan et al. speaks for itself, for those to care to read the literature in addition to blogs. Our 2012 work showed that the Galactic Center Excess (GCE) is there at a significance of 2Δln(Likelihood) = 419 improvement. Note that the Fermi-Team Science paper on detecting the gamma ray emission from the lobes of Centaurus A is 2Δln(L) of about 69! Converting 2Δln(Likelihood) = 419 of the GCE to an exact value of "sigmas" is not trivial but it is also not necessary, since approximate estimates put that level of 2Δln(L) significance at 30σ. Therefore, it is extremely significant. This is a statement of that set of model tests, which is certainly not a complete set of models. Our recent work included known diffuse emission associated with a recently detected cosmic ray electron population in the GC that is not included in the Fermi team's Galactic Diffuse models. We confirmed this diffuse emission, detected very significantly at 2Δln(L) = 185. The new diffuse components we test alter the spectrum and significance of the dark-matter-like GCE emission, but does not make it go away. 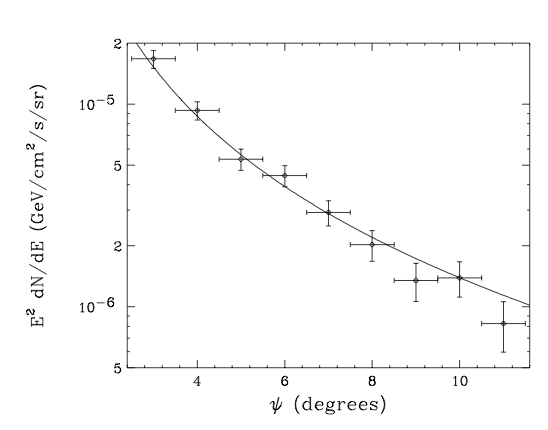 The significance of the DM-like source is at 2Δln(L) = 170.7, or, again roughly, 13σ. The spectrum of the GCE emission is dependent on the diffuse models, and our results indicate that b quark and τ lepton channels are statistically equivalent good fits. Including an approximation of the effects of bremsstrahlung in the annihilation cascade pointed out by Cirelli et al., we find that the τ lepton channel is actually preferred due to the softening effects of the bremstrahlung. Now, Jester asks very fairly why this seems so incompatible with what the Fermi Collaboration has said publicly. However, you have to parse carefully what is said by the lead Fermi-Collaboration leads in the analysis, Simona Murgia at the UCLA DM 2014 meeting, and Troy Porter at TeVPA 2013, and that is that their diffuse models account for all but 5% of the emission in the 15°×15° in the GC. In our recent analysis region, there are 670,631 photon events, 5% of which is about 33,000 events. That number of events, any particle physicist should be able to understand, can lead to a significant detection. Therefore, it will be extremely interesting to hear what the Fermi team says when their results are announced. Actually, the only person who implied that particle astrophysicists in general don't do statistics well was jester, who is not anonymous. However, many discussions, in particular the one by Lubos Motl, show a shocking lack of understanding that systematic uncertainties exist. Include the systematics or explain that they can be neglected or your statements are meaningless. I was referring to the anonymous posts on 6 March 2014 16:50 and 6 March 2014 18:49. And, if Mr. or Mrs. Anonymous at 8 March 2014 14:31 can bother to read something other than a blog and its comments, namely our paper arXiv:1402.4090, which I referenced in my previous post, he/she would find we discuss systematic uncertainties extensively. Kev, chillax, a bit of skepticism is good for blood circulation. And if it is true you will be the last who laughs. Just to precise one thing, I'm not saying the authors are doing their sums wrong. I only dare to say that astrophysical sigmas have a different weight. I would say the same about the LHC if they had to do their searches without knowing PDFs. Yes, it is the case that in the particle astrophysics community there are constantly implied systematic uncertainties even when they are not explicitly stated. That makes any claim of significance have an asterisk so that one has to delve deeper to find out what was done and why. And, Jester, certainly, I take your posts, having known the nature of your blog, to be provocative. Many comments here are instead simplistic insults of an entire scientific community. if you had mentioned the asterisk initially, you would have saved a lot of discussion. for anyone who wants a comparison, the lhc sees the higgs boson in thousands of events on top of a background that they understand. the claimed significance is about 10 sigma. so since it is a similar number of signal and background events and if we assume the background here is known just as well, it would suggest the asterisk translates into an actual sigma about a factor of 4 smaller. however, the background here is not know as well, so it would be easy to believe that the significance of the galactic center signal is actually much smaller than that. One more point along these lines: as I mentioned, our recent work does make a quantification of the systematic uncertainties, and finds, while they are significant and larger than the statistical uncertainties on the determination of the DM particle mass, they are still relatively small at 20%. Importantly, the systematic uncertainties do not extend to removing the whopping significance of the source, which is clearly significant statistically and systematically, even by eye in the maps we have made. As we've discussed extensively in our papers, the emission in the inner 7x7 degrees is consistent with entirely coming from millisecond pulsars, which you could call a signal or a background. Having the emission be consistent with millisecond pulsars out to 10 degrees away from the GC is very difficult but maybe not impossible. Clarification: By "emission in the inner 7x7 degrees" I mean the new extended source. While I realize comment threads on physics blogs may not be as genteel and deferential an environment as academia, I hope you can understand why even experts would be skeptical of such an extreme significance statement. And to be honest "go read my papers" is a poor retort given the diversity of readers here. Published papers are summaries of results and for the uninitiated serve more often to confuse than enlighten. I'd liked to be convinced that this work amounts to unambiguous evidence that some of the Fermi gamma-ray excess is due to Dark Matter, but the likelihood ratio calculation just feels off. This may be a failure on my part to understand the methodology, I readily admit. As Jester said, if true you will have the last laugh but I have a hard time imagining the result is as concrete as the papers claim. @West. This is likely why most academics shy away from often antagonistic and sometimes infantile blog discussion comment threads. Certainly I and my colleagues can say much, much more in a paper than on a comment thread. In short, my group's analyses as well as at least two other independent groups show unambiguously that there is a whopping signal of extreme statistical significance consistent with dark matter annihilation. Showing unambiguously it is from dark matter and not millisecond pulsars plus new diffuse emission in the crowded region of the Galactic Center of the Milky Way is difficult, and likely impossible. Most experts agree we must await confirmation of a signal from the gamma-ray-dim dwarf galaxy analyses. Given the signal you have observed in the galactic center and whatever is known about the distribution of dark matter in nearby dwarf galaxies, is it possible to estimate the signals from the latter? In particular, should we have detected already or maybe, should we see it soon (with current equipment)? Very significantly, as Hooper emphasized at his talk at UCLA DM 2014, no published results disagree with the overall finding of the existing published work of three independent groups that there is a huge new extended gamma ray source in the Galactic Center consistent with WIMP-like dark matter annihilation. There are some subtleties on trying to exactly determine what the spectrum and morphology of the source is, but that is the level at which the scientific work is at now. There's something between "Go read my papers" and spelling out every detail. You should be able to explain, in language understandable by a person who is well-versed in physics but is not an expert in your subfield, why this signal is so unambiguously specific to dark matter, why you have confidence that you understand background sources well enough to assert that it's not from something else, why you are comfortable enough to make a claim as strong as 40 sigma or whatever, and so forth. If an extraordinary result cannot be explained at that level, why should a funding panel (with people who are in your field but perhaps not in your particular sub-specialty) recommend continued funding? Why should a hiring committee offer a job to a postdoc who gives their seminar on these results but never explains them well enough for the hiring committee to get an idea of what the postdoc is doing? Why should a science journalist (who, ideally, is quite knowledgeable about physics but is probably not an expert in your particular techniques) report to the general public that these claims are important and likely to be a breakthrough (pending additional confirming data, of course)? Anonymous at 9 March 2014 01:54, the dwarf limits are not yet at the point of ruling out the GC signal, but many forecasts show that it may probe most if not all of the viable GC parameter space. See this plot, which is the forecasts status as of the summer 2013 conferences. Kevork, published work of Yusef-Zadeh et al. shows that the gamma ray sources in the Galactic Center region resemble the 20-cm radio continuum emission. They suggest the gamma ray emission is due to brehmsstralung. You mentioned yourself earlier that there is a detection of gamma ray emission from the radiolobes of Cen A. Since it is hard to believe that that emission is due either to dark matter annihilation or millisecond pulsars, another emission mechanism is more likely (e.g. inverse-Thomson scattering). Given the fact that Sgr A is a much more complex conglomerate of sources, observed at poor angular resolution with Fermi-LAT, consideration should be given to other possibilities than either a dark matter annihilation or a millisecond pulsar interpretation. This will help to convince astronomers as well as others that the dark matter interpretation is the correct one, even when you write on a blog site. Hi Albert, Our work arXiv:1402.4090 included the 20 cm diffuse emission map from Yusef-Zadeh et al., which has a similarly centrally-concentrated source yet different morphology and spectrum than the Galactic Center Extended (GCE) DM or MSP-like source. We found that the Galactic Center Extended source is still highly significant in detection, though its properties (flux & spectrum) depended significantly on the relative effects of the 20 cm source. Albert et al., just to be clear, our work and that of others, models much more than what is going on with the candidate extended source, and includes several point sources and diffuse sources in the region. In the specific case of our recent analysis, we modeled 19 point sources in the inner 7x7 degrees, the Fermi Collaboration's low spatial resolution diffuse model in the region, as well as three new diffuse components, including the 20 cm radio map, simultaneously while fitting the new Galactic Center Extended source that is the candidate dark matter source. "consistent with dark matter annihilation" is a long way from "is dark matter annihilation" in the case of a region of the galaxy where we have all sorts of activity, processes and background that we don't understand terribly well. The intuition that it is probably something else is enhanced by the fact that the parameter space ca. 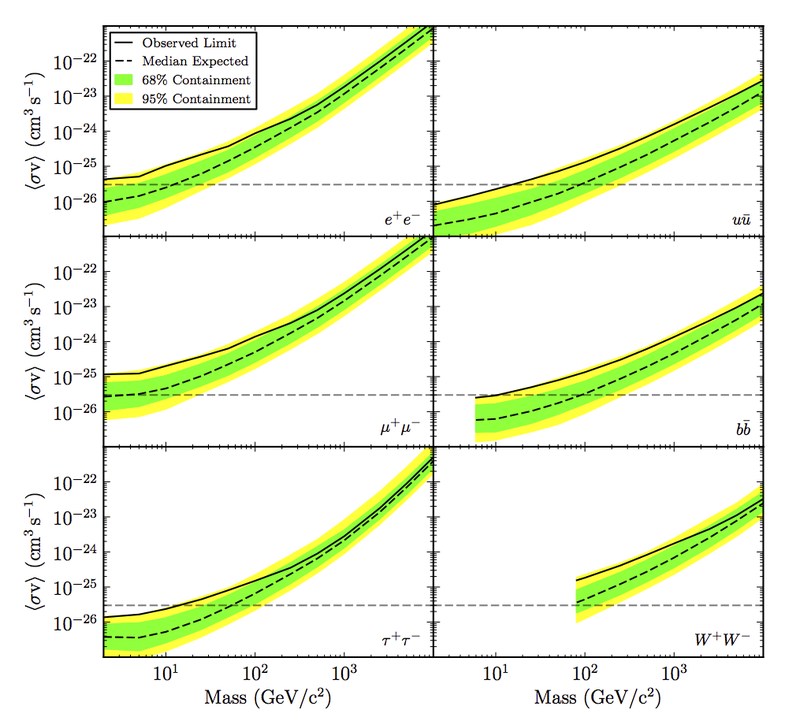 15-40 GeV has been combed very tightly by the LHC and prior experiments without results for a wide variety of weakly interacting particle candidates (these matters, for example, are below what ought to be discernable from W and Z boson decays) and are also disfavored by simulations of thermal relic dark matter particles of those masses which produce too many satellite galaxies, etc. compared with observed dark matter distributions. Further, these is a mass range that Earth bound direct collision with DM particle experiments should have seen, yet all of them, without exception, have ruled out that part of the parameter space with a combined significance that is impressive. Clearly, something is producing a signal, but the notion that it is a particle with a mass in this range annihilating runs up against very strong theoretical priors if that something is supposed to be dark matter. > thermal relic dark matter particles of those masses... produce too many satellite galaxies, etc. compared with observed dark matter distributions. This is not true. CDM is alive and well regarding Milky Way satellite counts. Satellite central densities are another thing, and remain problematic. For a recent review, see arXiv:1306.0913. > these is a mass range that Earth bound direct collision with DM particle experiments should have seen, yet all of them, without exception, have ruled out that part of the parameter space with a combined significance that is impressive. Exclusion of this parameter space by direct detection and colliders is a model-dependent statement, and they have not been demonstrated to be in general conflict with the GC DM interpretation. I do agree, however, that "consistent with dark matter annihilation" is a long way from "is dark matter annihilation." I have never said it "is dark matter annihilation," which supposes knowing something beyond what the data provides, at this point. There may be some confusion, though, because what is basically without controversy at this point for those that have done the analyses---in at least both in the published literature and in talks---is that there is a significant detection of an extended source in the Galactic Center. Furthermore, that source has properties consistent with dark matter annihilation. For those ambitious young particle physicists out there, you are free to do the analysis on your own to check---or extend---the previous results, as the Fermi-LAT data are public, and there is a step-by-step guide for extended source analyses here. To whoever believes in the 40 sigma significance, i am offering the chance of a lifetime to make money. 40 sigma is a p-value of ~10^-349. I am willing to give you an incredible advantage of ~10^341 and accept a bet of a cent versus a million bucks that this signal is fake. who wants to accept? Somehow, this possibility (probability?) of astrophysics masquerading as the signal, which I pointed out in 2010, keeps getting lost in the discussion. @Yet Another Anonymous: "I don't even know if I exist to a 40-sigma confidence." "Cold dark matter is expected to be sharply peaked near the galactic center ..." According to Kroupa, the Lambda-CDM model is ruled out. On the basis of overwhelming empirical evidence, Milgrom is the Kepler of contemporary cosmology. Is the preceding statement wrong? Note that Kroupa is scheduled to give a talk at the IAS on Thurs., 24 April 2014.